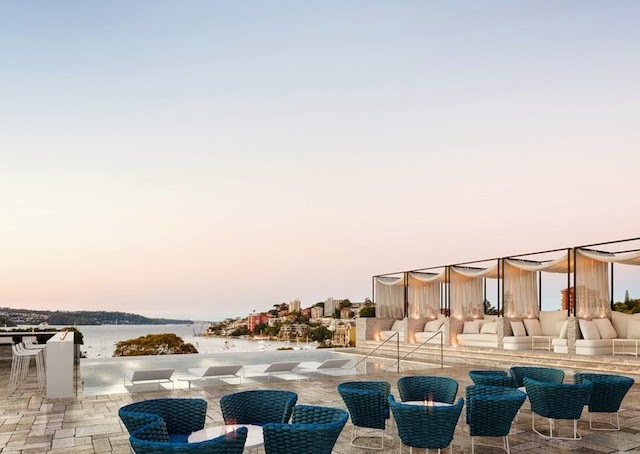 A sneak peek at a computer-generated image of the rooftop bar at InterContinental Hotel Sydney Double Bay. It seems that Double Bay is having a bit of a moment, with hot spots such as Mrs Sippy, Casablanca and the Golden Sheaf Hotel all helping the eastern Sydney suburb pull punters back into the precinct. There's more to come, with the InterContinental Sydney Double Bay today announcing that Julien Pouteau will be manning the pans as executive chef at the yet-to-be-named restaurant housed within the new hotel, set to open in November. Pouteau, ex-executive sous chef at Cafe Opera, the sister hotel at InterContinental Sydney, believes the lovingly revamped restaurant will be reinstated as an institution. While the hotel - which used to be abuzz with big shots and visiting celebrities - certainly pays homage to its artfully shabby chic past, Pouteau says the refurb will also pull the hotel firmly into the future. Pouteau says his pride and joy in the restaurant will be the newly installed robata grill, which refers to a Japanese method of cooking over hot charcoal. French-born Pouteau says he is "looking forward to cooking robatayaki-style as the wood charcoal gives the food a really wonderful and earthy flavour". General manager Frederic Brohez says he is confident that the wider community will embrace the concept restaurant, which will include all-day dining options and a destination bar. Brohez says the top-to-toe refurb of the hotel will see "140 rooms reinstated with key features". The revitalisation will also include the addition of a rooftop infinity pool and chi-chi chill-out zone, a majestic grand ballroom and a French provincial-styled courtyard. Brohez says he is thrilled to have Pouteau on board and believes the chef will be instrumental in contributing to a seductive experience at the hotel. "Julien is a great character. He's a very talented chef that is really more like an artist than a chef and a great match for what we are trying to do with the hotel. What are we trying to do? We are trying to reinvigorate Double Bay as a destination," says Brohez. "Sydney is more than a Bridge and an Opera House. If visitors want to experience the real Sydney, they need to explore its little coves and beaches and little-known nooks. The new hotel will be the perfect jumping-off point to enjoy Double Bay as a retreat within the wider urban context," says Brohez. "InterContinental Hotels are all about community. We want the public to come and enjoy this space. It's an iconic hotel. It has some great stories and history attached to it and this will be an exciting new chapter," he says. Hotel singh international offers great-value rates in New Delhi, 3 star hotels in karol bagh ’ walk from Karol Bagh Metro Station and Asia’s biggest Market Karol Bagh, an ideal place to experience the capital of India.Hotel singh international has well appointed Standard, Deluxe, Classic Deluxe and Suite Rooms that are equipped with all of the comforts you have come to expect to deliver a memorable stay.